On May 17 I had the fortune to attend an invite-only event held by Rubrik at their Palo Alto offices. The event, dubbed Camp Rubrik: Insiders Edition, was aimed at industry influencers and bloggers. Going into it, I didn’t know what to expect. I’m not a Rubrik customer, nor am I a partner. Aside from some great conversations with various Rubrik staff over there years at events like Tech Field Day or VMUGs, I really didn’t have much exposure to Rubrik. Luckily, I found out that I wasn’t alone in the regard. Of all of those in attendance (I believe we numbered 15 “campers”), I think only a handful had ever done much with Rubrik. I would argue that this is one of the biggest values for Rubrik: having a fresh set of eyes look at their product, poke, prod, and comment. In return, we were given very open access to Technical Marketing staff, product engineers, and even Bipul Sinha, Co-Founder & CEO. A good chunk of the agenda was dedicated towards hands-on with Rubrik’s platform. As mentioned above, most of us had never had unfettered access to the product. In this case, we were set up in an online environment, as opposed to each of us having our own appliance. We were also given manuals to follow along with, and at the end of each module we “earned” a badge (side note: I was concerned if TSA would question several pointy needles in my carry-on; they did not). The guide is designed to get us to perform common tasks, such as creating new backups, restoring SQL Server databases, as well as poking into the cloud instantiation feature. The first 30 – 60 seconds or so, I started familiarizing myself with the interface. After some quick self-orientation, I found the rest of the interface to be very intuitive. Within a few pages, I was able to easily move ahead at a good pace. Where am I going with this? 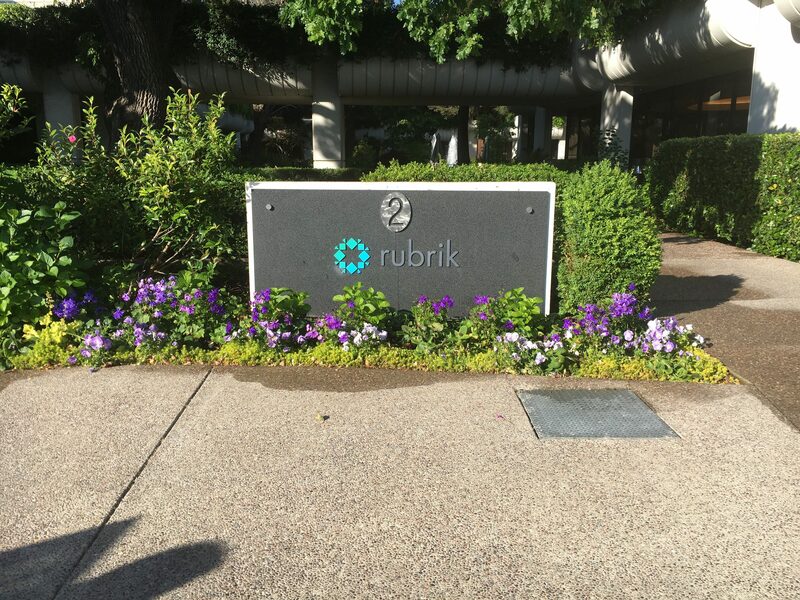 Rubrik prides themselves on being simple. Based on the interactions I had and the tasks that were extended, I would have to agree. Now we didn’t go really deep into things, but we did cover off what I would have to assume would be at least %90 of the common tasks one would perform. The first thing that really surprised me was the SQL Server restore. In the test case, we had a database to restore. Granted, the database itself was likely quite small (I didn’t think to look at the time), the process itself was straightforward. Find the backup, restore, and the refresh within SQL Server Management Studio and there it was. The cloud lab we were using was lagging at times (this was a very new environment strung together for this specific event), but I noted how quick the SQL restore was regardless. On-Demand: as the name suggests, when manually run your backup will convert to either a VHD for Azure or an AMI (Amazon Machine Image) for AWS. Auto Convert Latest Snapshot – Keep One: take the latest backup, convert it to run on AWS or Azure, and remove the previous copy. Auto Convert Latest Snapshot – Keep All: same as previous but does not remove the previous copy. Of note is that we couldn’t go through this in the lab as it didn’t have all the requirements/infrastructure built out for it. The idea of having an “always ready” copy of your machines in the cloud is an interesting, but potentially an expensive thought. DOES RUBRIK SOLVE THE PUZZLE? Enterprises need to protect their data, plain and simple. During camp, we only really played around with the data protection portion. CloudOn is a really cool feature. Mind you, Rubrik isn’t the only backup vendor out there to leverage restores to AWS or Azure. Their API-first nature is also a huge strength. I’ll touch on that a bit more in a second post on this event. This time around I want to focus more on the business side versus the product side. The downside to Rubrik? Cost, for one. We did not talk about costs at all (yay!) but I have talked to some of their sales folks before. I have also had many chats with customers, potential customers, and partners in the past. Don’t get me wrong, there is tremendous value for the cost, but the bar for entry tends to keep this out of reach for most small and medium-size organizations. That cost partially comes from the appliance-based solution. However, taking a quick look at Rubrik’s customer page you’ll quickly see that their target customer is more so in the enterprise space. Any solution at enterprise-scale is going to add up, so adoption in that segment likely isn’t limited by upfront costs. I have often stated that I do not believe in one size fits all solutions. Whether that is for storage, hypervisors, or in the case, backups, I still firmly believe that. Depending on what problem you are trying to solve (performance, capacity, feature set, simplicity, etc. ), Rubrik can make a lot of sense in a lot of places. Polaris brings with it a whole new scope, which will no doubt be appealing to enterprises. With that in mind, do yourself a favour and be sure to keep an eye on Rubrik. Disclaimer: All of my expenses, including food, transportation, and lodging were covered by Rubrik. I did not receive any compensation to write this post, nor was I requested to write this post. Anything written above was on my own accord.